Instant Imprints Chesterfield, MO | Custom T-Shirts, Embroidery, Signs and More! At Instant Imprints Chesterfield, our customers come to us when they want to be more visible to their customers. We create that visibility five different ways: Branded Apparel (embroidery), Signs & Banners, Promotional Products, Custom T-Shirts and Print Services. I've been buying things from Kim & Kyle since 2008. Every transaction has been seamless. The service is second to none. Call them for all of your promotional needs! Are you looking to promote an event, sports team or business with custom t-shirts, printing services, promotional products, custom banners or branded embroidery items? Then look no further than Instant Imprints in Chesterfield! We have the latest and greatest promotional item solutions so that you can stand out in a stylish way. From start to finish, your project is created right here in Chesterfield, with the help of a local Image Expert. This means that you get a world-class promotional service combined with a local Chesterfield touch! Instant Imprints is proud to provide Chesterfield with the highest quality branding service around. Just ask your phone, “Where’s the best print shop near me?” to find us! Our local Image Experts are happy to help you craft the best promotional goods possible and answer any questions you may have in a timely manner. We work to understand your project goals and help you make them happen. That’s why there’s no better promotional partner than Instant Imprints in Chesterfield! Custom t-shirts can make an impression wherever they’re seen, across Missouri and beyond. When your employees or customers sport your custom tees, they’re helping to promote your brand everywhere they go. That makes it important to use the right custom t-shirt design processes and materials to represent your brand in the best way. If you’re looking for a special way to customize professional attire or sports uniforms, our custom embroidery service is ready to help you make every shirt special. 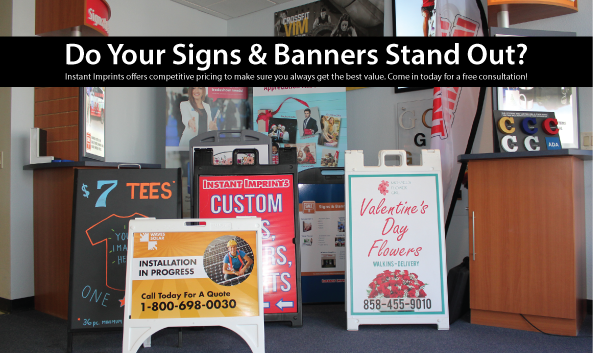 When you want your brand to stand tall, there’s no better way than with custom signs and banners from Instant Imprints in Chesterfield. Whether you’re trying to reach customers on the sidewalks or the highways, there’s a custom sign or banner solution to fit your needs. Our Image Experts are ready to help you pick the right combination of materials, fonts and other design features to ensure that your custom sign stands out above the competition. A professional trade show display or a sidewalk sign will make an impact on customers and colleagues alike! When you’re ready to take your brand visibility to the next level, stop in at our Hilltown Village Center Showroom, give us a call at (636) 728-0066 or request a quote online today!